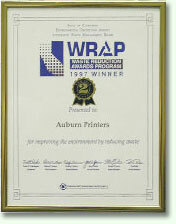 Over 90% of the printed paper waste is recycled weekly. We strive to recycle 100% of our "box board" either though recycled pickup or by reuse of the boxes. Total paper recovery in the U.S. exceeded 52 million tons in 2016. Producing recycled white paper creates 74% less air pollution, 35% less water pollution, and 75% less processed energy than producing paper from virgin fibers. 40 percent of all waste going to landfills is paper. Cutting down on paper waste will extend the lives of our landfills. APi-marketing has a history of prioritizing environmental stewardship with the use of sustainable materials and preservation of natural resources. Print is both environmentally and socially responsible as new technologies have allowed the industry to continuously strive for greener materials. This evolution allows us to use paper more efficiently and, more importantly, use safer materials for our workers, community, and environment. In cooperation with the Two Sides North America team we have captured the essence of responsible stewardship of our forest. Click to view our “flip book” and see what the facts are about paper and print. ...is an marketing campaign to raise awareness about the business and environmental benefits of print as an effective marketing communications channel. 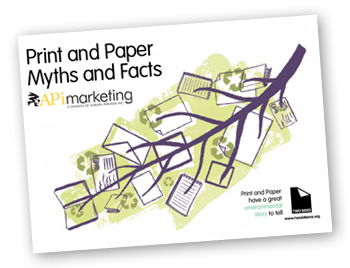 The campaign aims to dispel the myths and misconceptions that paper and print marketing campaigns are harmful to the environment. Paper and print provide a sustainable means of communication and are an effective medium in a multi-channel marketing campaign. The Waste Reduction Awards Program (WRAP) was an annual program, established in 1993 by the California Integrated Waste Management Board, that recognized California businesses that made outstanding efforts to reduce nonhazardous waste and send less garbage to our landfills. Though the California WRAP Award program ended in 2011, our commitment to reducing waste through recycling initiatives continues to this day.